The Lord Jesus told us that there are two roads in life—a broad road and a narrow road. We must choose which road we will take. The narrow road leads to Heaven. The broad road leads to a terrible place called hell. This place was not created for us. It was created for the devil and his angels. God does not want us to go there. 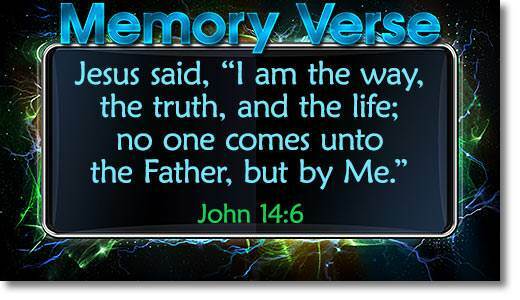 We get on the narrow road to Heaven by taking the Lord Jesus as our Savior. Jesus wants every believer to tell others about Him. Every believer can have the joy of winning someone to Christ. In this lesson we will learn how to do this. Winning souls is introducing others to Christ. A good way to start is to ask someone, "If you were to die tonight, do you know for sure that you would go to Heaven?" If they are not sure, you can ask, "Would you like for me to show you from the Bible how you can know that you are going to Heaven when you die?" Most people will be glad for you to do this. A person is saved by coming as a sinner to the Lord Jesus and receiving Him as Savior. It is helpful to think of this as taking five "steps." 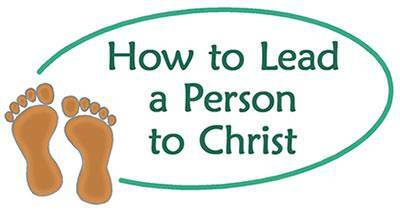 You can use this lesson to show someone how to receive Christ as Savior. Ask your friend to read the five steps, beginning with STEP 1. Be sure your friend understands each step before going to the next one. Be praying in your heart that God will help your friend to understand each step. Always use God's Word in leading someone to Christ. The first step in becoming a child of God is seeing that you have sinned against God. God loves us with all His heart, but He hates sin. Our sins have come between God and us. God so loved every person in the world that He gave His Son to die for their sins. But I must make it personal. It is not just, "God so loved the world," but "God so loved ME that He gave His Son to die for MY sins." God gave Jesus to ME to be MY Savior! God loves sinners! This verse tells us that God showed His love for us by giving His Son to die on the cross for us. The Lord Jesus died for sinners! He died for every person, but I must make this personal by saying, "Christ died for ME!" Say it out loud, "Christ died for ME!" *Do I believe that Jesus is God's Son? *Do I believe that the Lord Jesus died on the cross for my sins? *Do I believe that the Lord Jesus would come into my heart right now if I asked Him to? You can take the Lord Jesus as your Savior now! 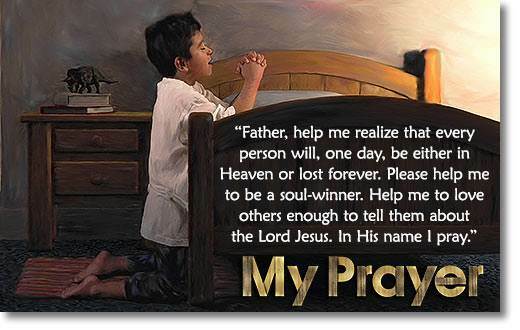 If the prayer below says what is in your heart, pray it to the Lord Jesus now. Ask Him to be your Savior. The Lord Jesus would love for you to talk to Him now. "Lord Jesus, I know that I am a sinner. I am truly sorry for my sins. I believe that You are the Son of God and that You died for my sins. Please come into my heart. I am taking you as my Savior right now." This verse tells us that God sees two groups of people in the world—those who believe on His Son and those who do not believe on Jesus. If I am in the group which believes on the Lord Jesus, what does God say about me? He says, "He who believes on the Son HAS everlasting life." If I have trusted Christ as my Savior, I HAVE everlasting life. How do I know this? I know because God says so in the Bible! You may be a new Christian and you are wondering what you can do to serve the Lord. You can tell others what Christ has done for you. You can tell others about this online Mailbox Club. You can help them join this Mailbox Club. There are lessons for all ages. In His Word, God says, "…he who wins souls is wise" (Proverbs 11:30). God has promised great rewards for those who win others to Christ. You can use this lesson to show your friends how they can take the Lord Jesus as their Savior. Think of the joy of seeing Jesus face-to-face, and hearing Him say, "Well done, good and faithful servant! Enter into the joy of your Lord." 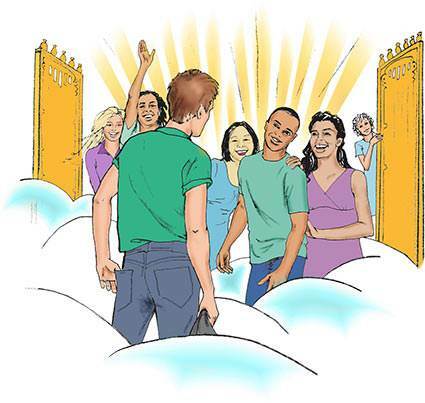 Think of the joy of entering Heaven and meeting those whom you led to the Lord Jesus! Dear friend, will you let the Lord Jesus use you to win others to Him? Ask Jesus to help you. When you win someone to Christ, we would love for you to tell us about it. Just use the "comments" box at the end of the Quiz for this lesson. Jesus told us that there are two roads in life—a broad road and a narrow road. 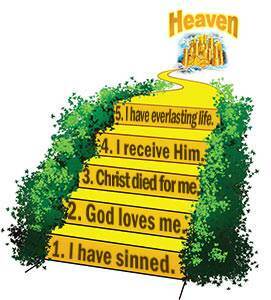 I got on the narrow road that leads to Heaven by taking the Lord Jesus as my Savior. Every believer can have the joy of winning others to Christ. Do I love the Lord Jesus enough to tell others about Him? The campers have packed their suitcases on the last day of camp. They share with their buddies how special this week at camp was and go to the assembly hall for their last meeting. Mr. Douglas begins to speak to them. "Boys and girls," Mr. Douglas began, "this has been an exciting week at camp. You have all grown in your knowledge of God, His love, and His forgiveness. 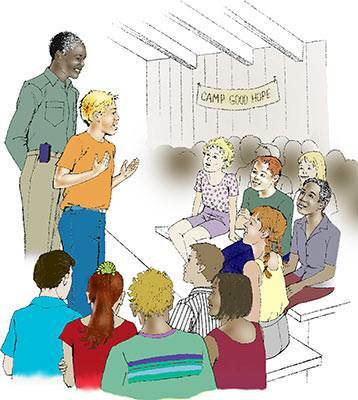 "Many of you know that there has also been trouble at camp this week. Things have been stolen and personal items damaged. Those involved have been understanding and forgiving. This is the way God is with us. When we show God's love instead of our anger, God can touch the hearts of others." Mr. Douglas told the children that Biff had been found late last night. He was not hurt, but was too worn out to attend this meeting. Then Mr. Douglas went on to explain that when we disobey, we not only bring trouble upon ourselves, but also upon our family and friends. "Always remember that the sin of disobedience has many consequences," Mr. Douglas warned the campers. "I am glad to say," Mr. Douglas smiled as he continued, "yesterday's trouble has caused one boy to change his ways. Pete, please come up and tell us about it." Pete slowly made his way toward the front. "I don't know much what to say," he paused, but then went on saying, "I—I am sorry about taking Bobby's money. I have already paid him back and asked him to forgive me. "And—I am very sorry that I cut Steven's wallet. I guess I was angry at Steven because he was trying to be so good. I kept telling myself that I was not going to read the Bible, learn the verse, and all that stuff." There was silence in the hall as Pete continued slowly, "But down inside me, I felt mean and miserable, and I knew I did the wrong things. When I told Biff about it, he got mad. We had a fight, and I got stung by hornets as you can see. "Then Steven and Randy helped me get back to camp. I could not believe it, after what I had done," Pete said excitedly. "I had been so mean to Steven, but he was so kind. I told him that I was sorry for cutting the wallet, and he forgave me. He also told me how I could ask Jesus to forgive me and be my Savior. So—I did, and I—I am—very thankful to my buddy, Steven." "Thank you, Pete," Mr. Douglas said smiling. "We are all very glad that you have taken Jesus as your Savior. You will find that it is the only way you can be truly happy." Mr. Douglas continued, "Make sure you find some Christian friends when you go home! This is so important for all of you because you tend to become like those whom you choose as your friends. And remember the camp verse. It will help you make the right decisions." After some songs, the children were dismissed. Pete, Steven and Randy walked out together, laughing and making plans for this last day of camp. After lunch, the children had fun and cheered for their buddies in the games and relay races. Maria was only a few points behind Susan in the contest to win the prize Bible. The girls knew that they could still earn points in the different games and races. Maria had struggled all week with the thought that she wanted to win the prize Bible herself. But she also knew in her heart that she was selfish, because Susan needed a new Bible more than she did. All week long, Susan had been a very unselfish person, and deserved to win. The pairing of the three-legged race was announced. Susan and Linda Sooter were paired together. Maria was happy for Susan because she knew that Linda was very fast. She was cheering them on as they came in first. Maria and her partner Sally came in last. Susan had won more points, and Maria gave her friend a big hug saying, "You deserve to win that Bible. I am so happy for you—we will have to wait until tonight to be sure." When the last race was over, everyone returned to their cabins to finish packing and get ready for the closing meeting. Susan sat down on Maria's bed and said with a sigh, "I cannot believe camp is over. I wish it would go on. We had so much fun." "I know. We have learned so much about Jesus. I am so thankful that He has helped me to grow," Maria answered. "And, Susan, you have helped me too, because you are so unselfish." Suddenly Maggie came into the cabin. "I would like for you to meet my parents," she said with a smile. Maria put her arm around her buddy and said to Maggie's parents, "Maggie and I have become special friends. We want to stay in touch." During the afternoon, more and more parents arrived. Steven and Maria had a wonderful surprise. Not only their parents, but Grandma had come also! 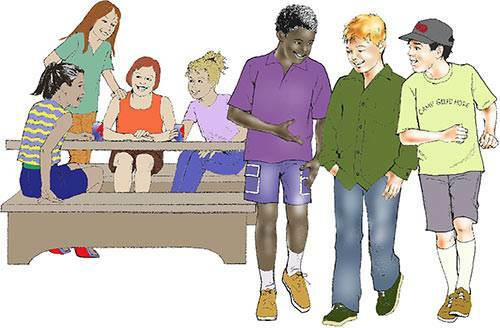 After the children had excitedly shown their parents around the camp, everyone met in the hall for the last meeting. Mr. Douglas stood up with two Bibles in his hand. He first greeted the parents and then said, "Boys and girls, many of you have been outstanding in your cooperation, obedience, and helpfulness to your buddies." Then he announced the winners of the Bibles. "The winner for the girls is Susan Blake." Maria jumped up and gave her friend a big hug. Steven was happy that Bobby won the other Bible. Steven and Maria would never forget this camp! They had learned what it means to "walk worthy of the Lord." They had seen God do great things. Their Christian friends had grown spiritually. They had seen their prayers answered. Best of all, God had used them to win others to Christ!